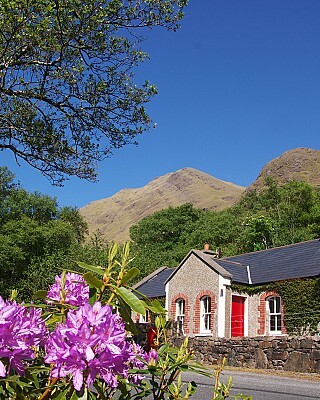 The largest of the five cottages on the Delphi estate is Wren’s Cottage which sleeps 6 to 8 guests and has three bedrooms and two bathrooms, all at ground floor level. The master bedroom, with en-suite bathroom, features a super king-size double bed. Of the other two bedrooms, one has a double and a single bed and the other has three single beds. These two bedrooms share a bathroom. Each bathroom has a power shower and bathtub. The kitchen is well-equipped with an oven, electric hob, microwave and washing machine. The sitting room has a large open fireplace and, for news addicts, satellite TV and Wi-Fi. There is comprehensive central heating throughout.